The new book is available for purchase thru the me as well as thru the publisher and Amazon.com. Be sure to order your copy today. 'Memphis Wrestling History Presents the 1950s' Is Now Available! MWH's latest book is a record book looking back at the Memphis Wrestling that took place during the entire decade of the 1950s. The cards and results included are for the Monday Night weekly matches. Each chapter represents a year and cover 1950 thru 1959 and has a short yearly review at the beginning of each as well as photos of some of the wresters that were highlighted that year. The cards and results of each Monday night for the entire decade of the 1950s is included in this book. This book is considered a companion piece to the previously released 1960s book and the 1970s book. 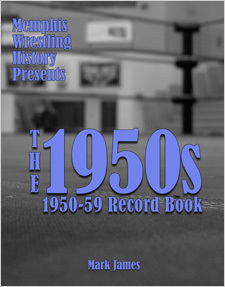 Memphis Wrestling History Presents the 1950s (330 pp.) is available now! It is priced at $21.99 and is available in print at AMAZON.COM as well as the publisher's WEBSITE. For our international fans, please go HERE to order your copy of his book.